Now it’s time to plan! 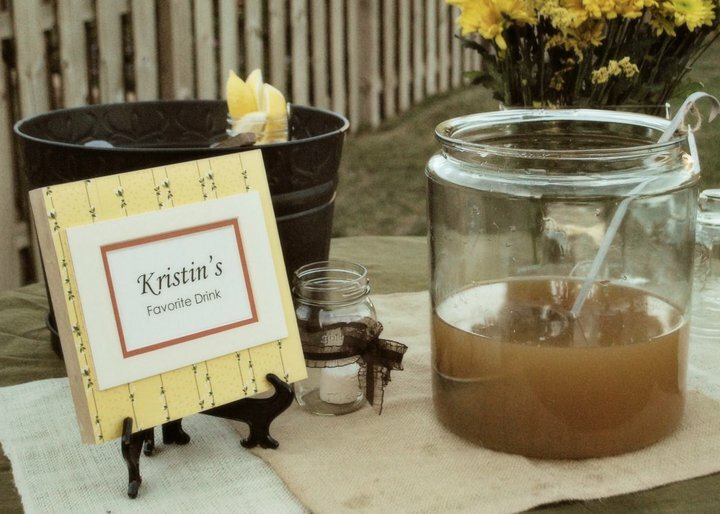 One great way to save money is choose items that can serve multiple purposes at your party. This event is a great example of using necessities as part of the decor. For seating, we bought hay bales from a local place that agreed to let us return them if they were not damaged (or wet). We placed random material and burlap over them and tied them with ropes to protect people’s legs and clothing and it also added some flair. Not only did it served the purpose for seating it matched with the theme as well. 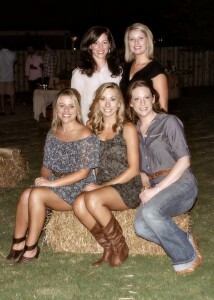 Our favorite addition was probably our reels/spools we scored for free from a utility company! 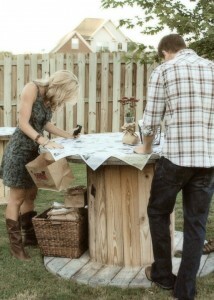 We needed tables for the food and these round “tables” are perfect for a stand around and eat situation. We decorated the spools with newspaper and burlap. We tied bows around some of them to give a variety. We also got some smaller reels to use as drink tables etc. Depending on the time of year you can buy some fresh flowers to sprinkle some color around. We chose mums for our event. 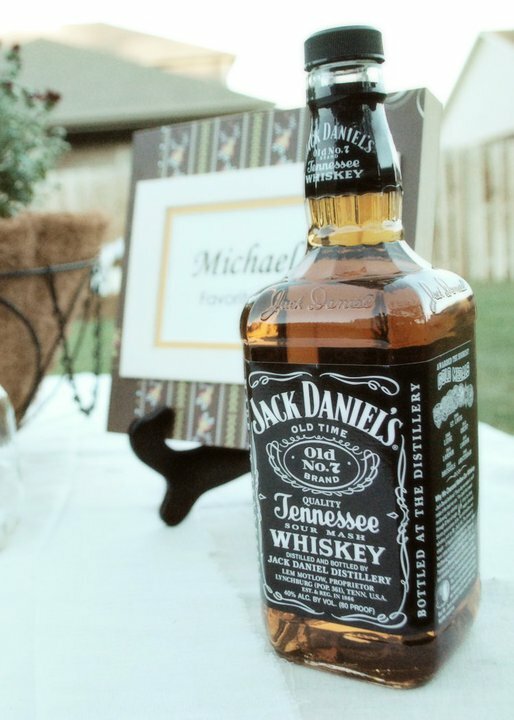 Use empty bottles such as wine, champagne and Jagermeister bottles to put candles in for table decoration. If you don’t have spare bottles you can pick some up at any glass recycling center or drop off location. 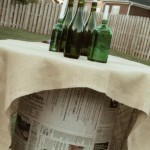 Use brown paper bags for plates and also for trash bags. You can buy these for super cheap it you don’t have a supply laying around or a connection to a grocery store bagger. Make cute labels for the trash bags. We stapled them around each table for the seafood shells. Fill a large pot with enough water to cover all of the ingredients. 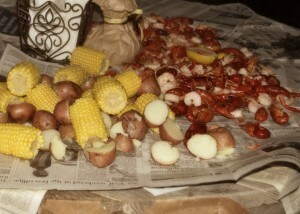 Add the crab boil and bring to a boil. Adjust the crab boil to suit your taste. When the water boils, add the potatoes and sausage. Cook on medium heat for 20 minutes. Add corn and cook for an additional 10 minutes. Add shrimp and cook for no more than 3 minutes. Drain and serve with warm bread. Don’t forget your desert! 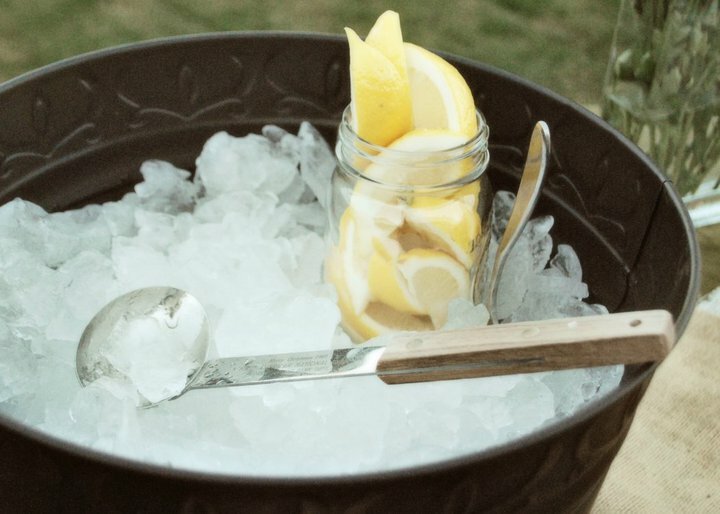 We recommend something fun like banana pudding or an ice cream bar. 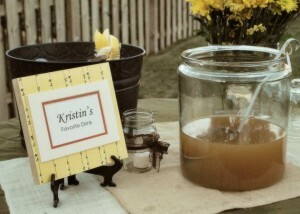 For alcohol we served the bride and grooms favorite drinks in mason jars. We also had beer, your basic tea, water and some old fashioned bottle drinks that served as decor as well. 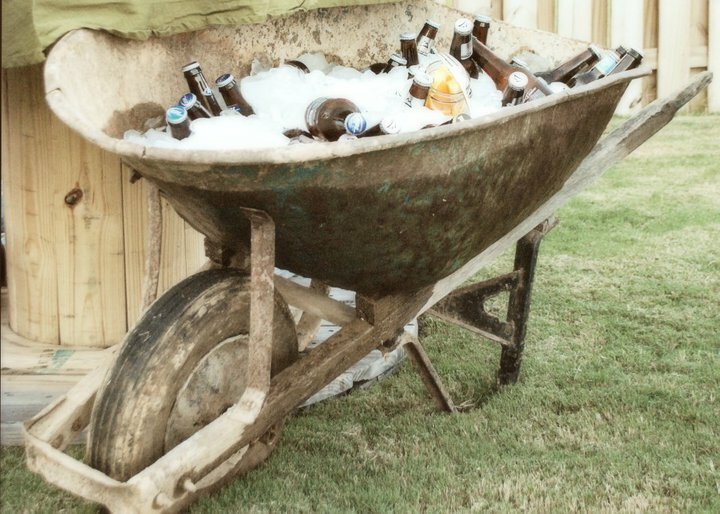 We placed the drinks in an old wheelbarrow. One good thing about living in Alabama is that you can find these things laying around if you know where to look. Don’t forget to make labels. It’s and easy way to add a lot with a little to know money. 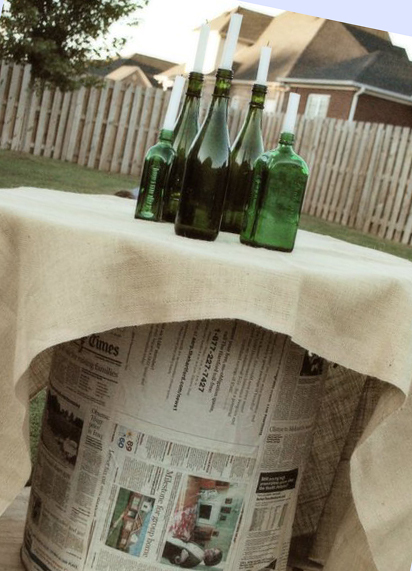 All you need is a little paper and a shoe box lid. 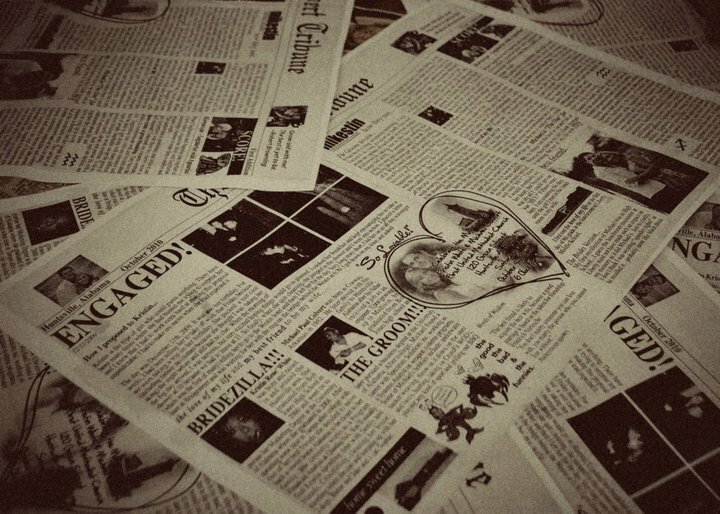 It’s important to put a special touch into your party planning We created a newspaper from information about the couple. Their wedding site was a great material source. They were cheap to print and we were able to eat on them too! 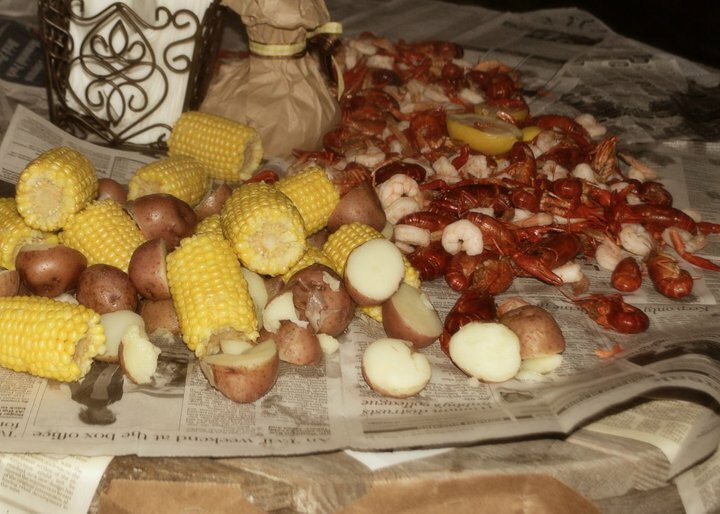 Low Country Boil is a great theme for showers, engagement parties, birthdays, or if you are just looking for an excuse to have a get together. You can Mardi Gras it up with hurricanes and Cajun spices. The options are endless! Have fun!